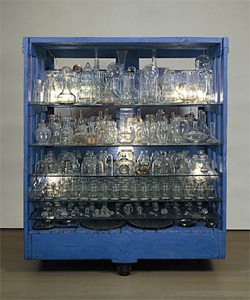 Holland Cotter wrote a delicious review of Louise Bourgeois, currently at the Guggenheim through September 28, 2008. Bourgeois, 97, was born in Paris and lives in New York. While her work has been associated with the major movements of the 20th century, she has remained faithful to a style uniquely her own in the face of the sometimes macho art world. MoMa held a major survey of her work in 1982 and she has held a firm place on the global radar ever since. Ms. Bourgeois has worked in many mediums but is most famous for her abstract/organic sculptures, first executed in wood and later in rubber, bronze, stone, latex, marble, and fabric. Her work grapples with many psychological issues ranging from depression, anger, guilt, insomnia, and most importantly her painful memories of childhood innocence lost. The spiraling interior of the Guggenheim mirrors recurrent shapes in Ms. Bourgeois’ oeuvre, providing a fitting setting for her inspiring pieces. Click here for more information on Louise Bourgeois, including interviews and slideshows of her at work through the PBS art:21 series.